Some schools do have a coat of arms, but in most cases it is more a crest/badge that represents the school which is made up of heraldic devices relating to the history of the school itself. Heraldic Shields/Wall Plaques can be produced for Infant Schools, Junior Schools, Comprehensive Schools, Public Schools, Boarding Schools, Private Schools etc, displaying the school coat of arms, crest/badge, which can be used for many different purposes such as Presentations, Awards, Trophies, Promotions, Gifts, mementos etc. A common use for Heraldic Shields/Wall Plaques in schools is among the sports departments, some of which go on Tour once a year travelling the world, often this relates to Rugby Clubs, Football Clubs, Cricket Clubs etc, who are looking for a special gift, memento, or promotional item that represents their school to take with them, and Rowan Heraldic Shields/Wall Plaques are the perfect solution! 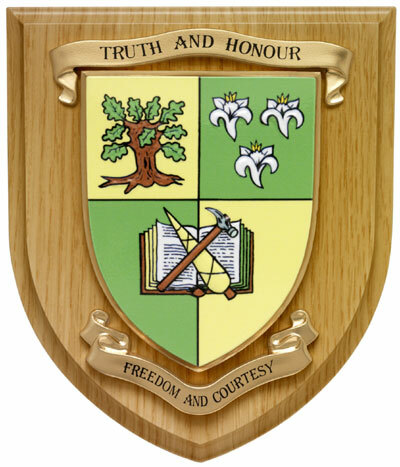 In many cases Heraldic Shields/Wall Plaques are available in schools for pupils and staff to purchase as a memento of their school, this is more common within public schools, private schools and boarding schools, and often Heraldic Shields/Wall Plaques are purchased by a pupils parents, or even grandparents, and given to the child as a reminder of the school they are proud to be attending. As manufacturers and suppliers of distinctive Heraldic Shields/Wall Plaques for over 14 years we have established a long line of satisfied customers from around the world, one of which is Rothesay Netherwood School, Canada (see image on left), to see what they had to say about our products and services please click here.